When I was studying Shakespeare’s ‘Henry V’ back in the 60s, I liked to refer to the war-like Harry as ‘Hank the Cinq’. That was partly because I was a smart arse – yeah, nothing’s changed – and partly because I was aware of Henry’s French connection. In fact, this Plantaganet monarch was the first such to write all his formal letters and court documents in English. I think that decision evidences his shrewd and pragmatic nature. Certainly, as the play unfolds, there’s plenty more evidence to suggest that at least some of his apparently wild youth was spent observing and learning life’s lessons. Bear in mind that when the play first appeared in 1599, England was beset with many problems: Rebellion in Ireland not being handled well by Essex; Famine across the land with successive failed harvests; A long and costly war still being fought against Spain in the Netherlands and an ageing Queen Elizabeth approaching her final years with no heir. All of the uncertainties around the succession which gave rise to the War of the Roses once more flickered to life – this time fuelled by Catholic urgings to have Elizabeth’s former brother-in-law, Phillip of Spain, assume the English throne. What better time for the newly constructed Globe theatre to present a morale-boosting, blood and thunder account of an all-conquering English king, written by the country’s most popular playwright? I’ve got two filmed versions of Henry V on DVD and watched them both during the past week. The first was made in 1944 and was directed by its star, Laurence Olivier. The second was made in 1989 and also starred its director, Kenneth Branagh. Both films weigh in at around 140 minutes, both are in colour and both boast an impressive score – by William Walton and Patrick Doyle respectively. Branagh’s Henry is altogether more self-possessed. Confident, calculating and portraying a deep awareness of the political arts, taught to him by his wily father, Henry IV, and embellished around the taverns of Eastcheap whilst in the company of Sir John Falstaff and his street-wise cronies. Indeed, there are aspects of Branagh’s film that fall just shy of portraying the invading force as a bunch of upper-class lager louts with a sense of entitlement, on a day trip to France to see what spoils may be had. The story is probably familiar to you. 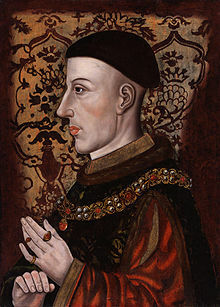 Having had his claim to the French throne justified by the Archbishop of Canterbury, Henry and his army sail to France, capture Harfleur, rout the vastly superior French force at Agincourt, forcing the French king, Charles VI, to concede to Henry’s territorial claims as well as marrying off his daughter, Katherine, to Henry. What’s interesting about the earlier film is what’s left out. In the text, whilst preparing to sail for France, at Southampton, three nobles – Scroop, Cambridge and Grey – are discovered to be plotting to assassinate Henry. They are arrested and executed. Later, at Harfleur, Henry delivers a blood curdling threat of no quarter to the town’s governor, if he does not surrender. And then, just before Agincourt, Bardolph, one of Henry’s earlier drinking companions, is found looting and summarily hanged. None of these scenes appear in Olivier’s film. As the film was made in 1944 and generally released the following year when the allies had landed at Normandy and were advancing toward Germany, I imagine that showing English traitors, murderers and looters in a film designed to stir up patriotic feelings was not considered to be a good idea. The film was also partly funded by the Government – so you may draw your own conclusions. Branagh’s film, on the other hand, includes these scenes and the battle at Agincourt is portrayed graphically. I was struck by the contrast of Branagh’s heroic delivery of the St Crispin’s Day speech and the tragic battle that ensues. No doubt, this was an implied commentary on the futility of war, although a far more direct example is portrayed when the French attack the English baggage train and slaughter the pages left to guard it. This scene appears in both films and much is made of it. Why? Once the battle appeared to have been won by the English, news came to Henry that the French had sent for reinforcements. Fearing that any prisoners would hinder their ability to repel another French attack, Henry ordered his men to kill all the prisoners. The attack on the baggage train is often used as a mitigating factor to justify Henry’s order. The battle of Agincourt was fought on 25th October 1415. Less than 7 years later Henry V was dead, from dysentery, whilst once more campaigning in France. Had he lived another 3 weeks, he would have been crowned King of France under the terms of the post-Agincourt treaty. He was 35. An ironic footnote to the events of October 1415 is to be found in the decision of the Supreme Court of the Amalgamated Kingdom of England and France in 2010 to find Henry’s slaughter of the French prisoners legally unjustified – and to award unspecified damages to the estates of those prisoners. This was a mock trial featuring eminent jurists and held in Washington DC. This entry was posted in Film, Retro and tagged Kenneth Branagh, King Henry V, Laurence Olivier. Bookmark the permalink. Thanks Peter. There have been a few historians I’d quite like to boot.